Welcome... Sit!, Stay!, and browse our pages! Miniature Pinschers and Bloodhounds, Puppies born in the HEART of the USA, raised to give LOVE. We live on a small farm in south centeral Missouri where our goal is to raise quality puppies. We raise Miniature Pinschers in several colors including black & tan, chocolate & tan, blue & tan and fawn & tan and an occasional red. We raise Bloodhounds in all three colors, red, black & tan and liver & tan. All of our puppies are loved and cared for on a daily basis. They are held, cuddled and talked to from the first day they arrive. They are born into a loving family. We want to pass that love on when they leave us to go to their new families. We do not put any of our dogs in small cages suspended off the ground where they never get to run. We believe that is cruel and inhumane. We treat our dogs as part of the family and we want them going to homes where they will continue to get that same undivided love. So please, before you contact us be prepared for questions from us and feel free to ask us anything you would like to know about our puppies. The Best Medicine is a puppy dog!!! A dose of canine companionship may be just what the doctor ordered. Thanks for dropping by to visit, come back as often as you would like and feel free to call and talk to us about our doggies!! Clicking on the picture above of the three Min-Pin girls. 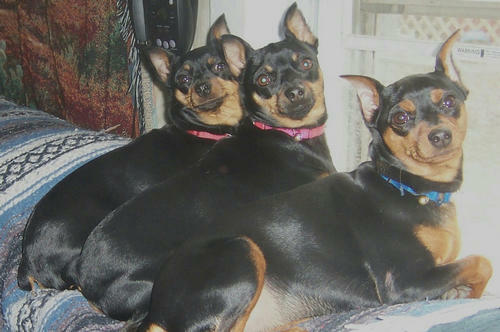 Annabell, Mouse and Tinkerbell will take you to our Min-Pin puppies for sale. Clicking on the Bloohound picture below of Bear will take you to the Bloodhound puppies for sale. of my tail when your footstep falls on my waiting ear. beside the hearth...for you are my god, and I am your devoted worshipper. Keep my pan filled with fresh water, for although I should not reproach you were it were dry. with my life, should your life be in danger. breath I drew, my fate was ever safest in your hands. Remember me not with tearful eyes...but instead with an abounding heart. and they too will love you as I always have. All of our puppies are AKC CAR Microchipped for lost pet tracking before leaving us. In order to put the chip # in your name you must contact the chip company, fill out the form and send it in with $19.50. This is an added security for you and your new pet and registering your puppy's chip is required as part of our puppy contract. Miniature Pinschers come in a variety of colors: Stag Red, blue stag, fawn stag, Red, Tan, Black & Tan, Black & Rust, Chocolate & Tan, Chocolate & Rust, Blue & Tan, and Fawn and tan as well as merle of those base colors. 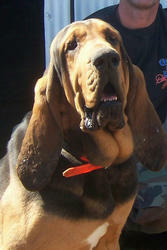 Bloodhounds come in 3 main colors: Red, Black & Tan, & Liver & Tan. Please let us know which breed, color and if you are looking for either male or female when emailing about availability of puppies. Thanks for looking at our site and browsing through our puppy pictures. This site is dedicated to my son Donavan and his unit who are proud members of our Missouri Army National Guard, and to all those serving in our United States Military branch's. May God always be with you where ever you are!